This beautiful quality home is a must see with its brand new updates - new flooring, new black stainless appliances and new light fixtures! 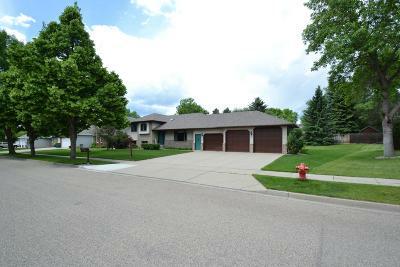 And the location is highly desirable near shopping and restaurants with easy access to I-94. There are 3 bedrooms on the upper level including the large master suite with heated bathroom floors and huge walk-through closet, along with 2 more bedrooms in the lower level. The home has an open feel with vaulted ceilings and lots of natural light. The kitchen has a tray ceiling, an abundance of custom cabinets for storage along with new black stainless appliances, a cook top stove and double ovens - all ready for you to get your entertainment on. The main floor laundry room has plenty of space. There are french doors off of the dining area leading to a large deck to enjoy the outdoors along with the lovely 1/3rd acre yard with mature trees and a sprinkler system. The lower level also includes a huge family room with a beautiful bricked natural gas fireplace. The 800 sf unfinished basement with egress windows, a utility sink and convenient double access from the family room and the garage entrance, is ready for you to make it your own or simply use as storage space. The heated triple garage is over-sized at nearly 1,000 sf of space with a ladder to access the upper storage area. The home is super-insulated including raised heel truss rafters. Has radon mitigation system and central vac. Garage heater is radiant infrared heat. Has Blown In wall insulation and electric attic fans. Roughed in plumbing for wet bar behind built in cabinets and east wall in lower level family room. One owner - smoke and pet free. Call for a showing today!